This morning we awoke to screeching corellas flocking onto the lagoon and the howl of a distant dingo. For me there are no other sounds synonymous with the outback. After the woop woop alarm at the Cooper’s Creek camp I am becoming more tuned to the early morning sounds. It will be interesting to note the dawn sounds as our odyssey progresses. 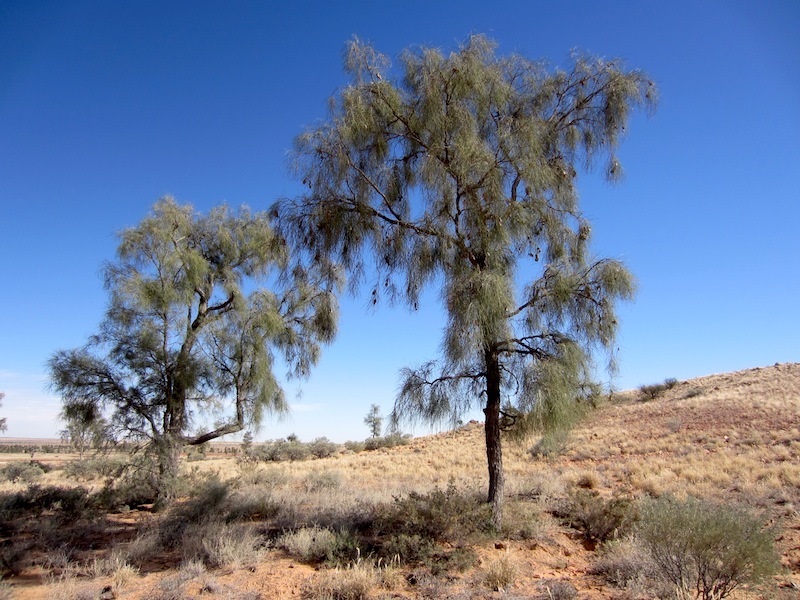 Our first stop after leaving Birdsville was an area about 12km north where rare waddi trees (Acacia peuce) grow. The wood of the waddi is considered to be Australia’s most dense. It is so dense that it will not burn and the trees only grow around 150mm per year (probably less in dry times) which means the clump we visited today ranges in age from 500 to 1000 years old. Nearby to the waddis is a mesa, which we climbed and from the top you see the trees extending well into the horizon like sentinels guarding the desert. Aboriginal folk believe the trees are the spirits of ancestors and if you find one standing in isolation it is said to be a lost spirit. All the trees in the distance are waddi trees. We have never camped on the top of this mesa but I would like to one night. Not much firewood about though. The rock cairn has been built by visiting travellers; the idea is to carry a rock up and place it on the pile. 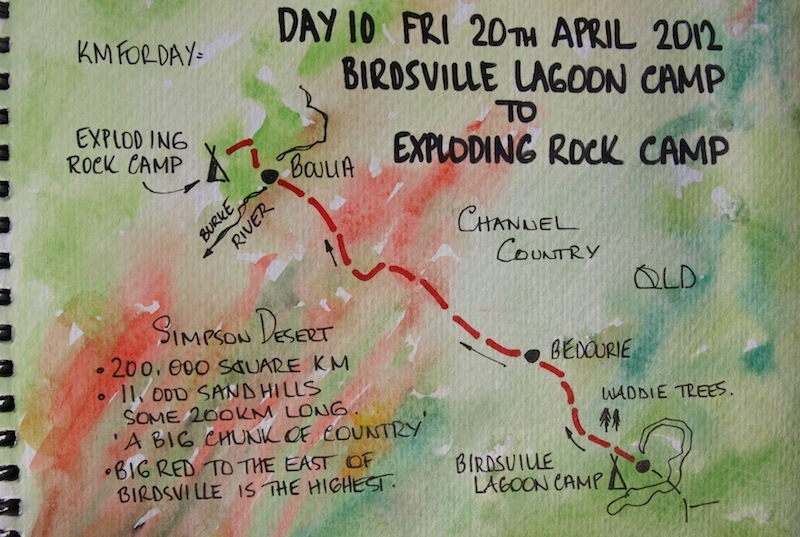 The drive from Birdsville to Bedourie is not boring by any means, in fact it could be classed as one of Australia’s epic drives as the road traverses the eastern edge of the Simpson Desert and the western edge of the vast Channel Country. Following record flood rains this year; water was lying up to the road edge in places giving the impression we were driving through an inland sea. 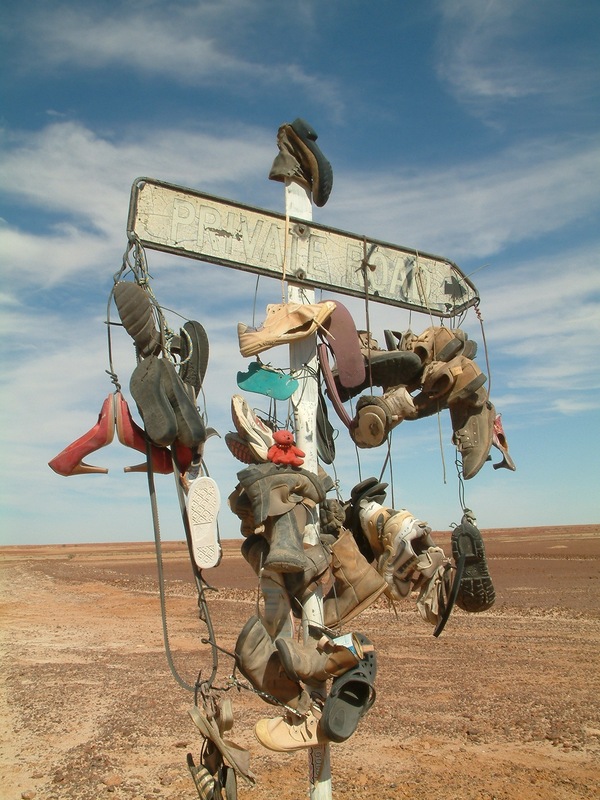 There are curiosities along the way to Bedourie and one is a property sign from which an assortment of footware hang. I imagine that the landowner when giving directions to someone intending to visit said he’d hang a boot on the sign and since then people have added more and more pieces until the sign is almost to collapsing point. 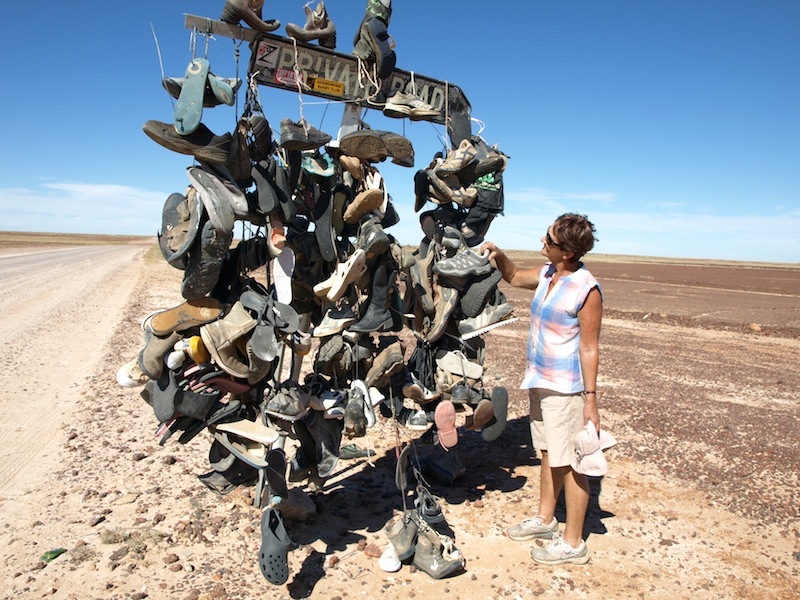 The shoe shop north of Birdsville. Bev looking for a new pair of joggers. The same shoe shop in 2009. It is interesting to note the red high heels are not in the present day photo. Have they been sold? The major watering hole along the track today was Boulia and its claim to fame is the elusive Min Min lights. Night travellers who see the lights describe them as an orange ball of light that either hovers over or follows them. There are many theories as to what causes the phenomena. Some say it is gas escaping from the earth’s surface, others suggest it is a flock of birds with reflective wings but more the truth is it is a night time mirage caused when cold and hot layers of air collide creating a mirror effect reflecting maybe a camp fire light or car headlights. I have never seen a Min Min light but if I had maybe I would accept a paranormal explanation. 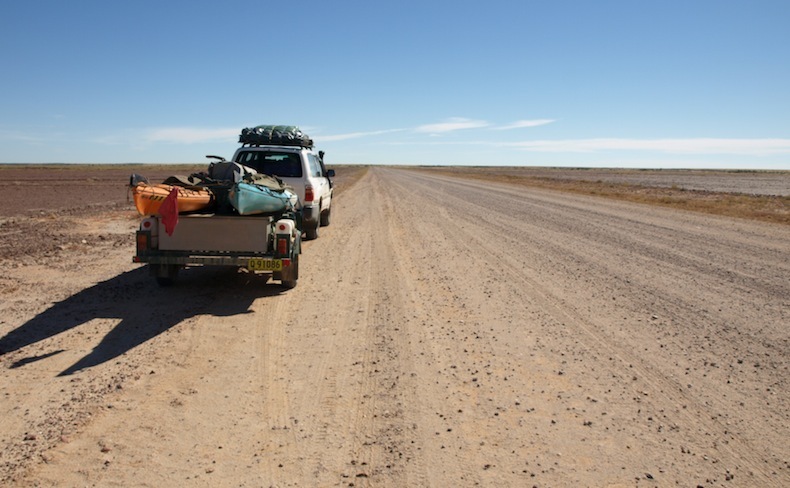 Not long after Boulia we began looking for a camp. There was no shortage of places, it was simply a matter of selecting a place where it was easy to get off the road. The spot we found is high on the Hillier camp scale. 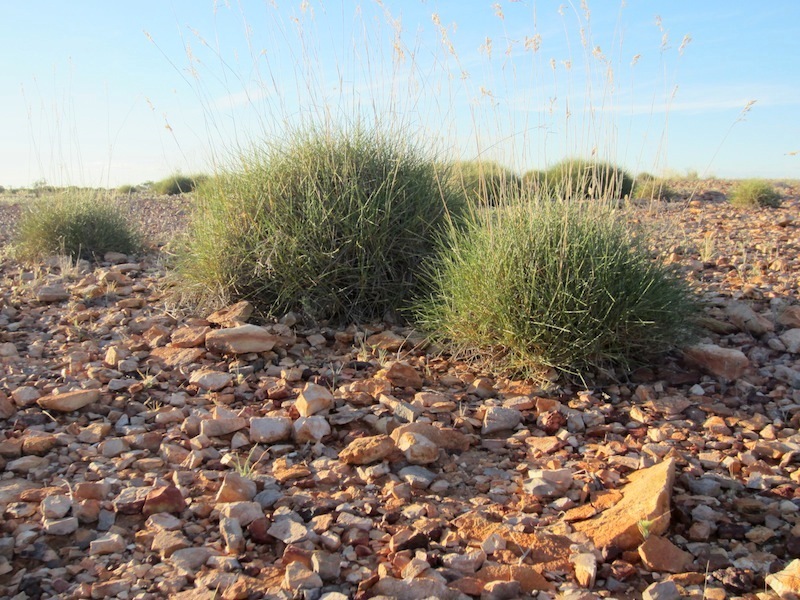 Spinifex or hummock grasslands cover 22% of the Australian continent and is the most extensive vegetation type in Australia. It’s an attractive plant but not the sort you want to get chummy with because it has needle-like spikes. Explorer Ernest Giles called it an abomination, as it was most uncomfortable to travel through. However I wouldn’t mind a garden like the image above on our property, the only thing I would add is a red earth termite nest. I call this camp the Exploding Rock Camp. Because we propped the fire grate on a couple of rocks and once the fire got going they began exploding with force. The stones were sandstone and being porous contained a lot of water, which turned to steam and blew them apart. 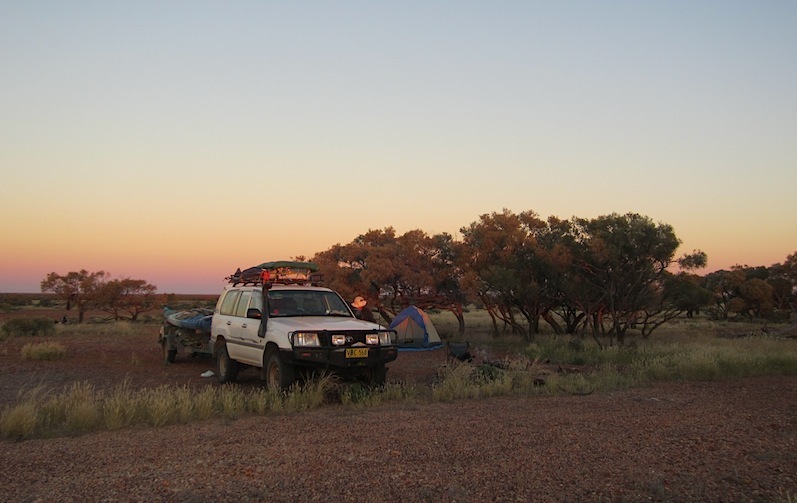 Tonight’s camp, about 40 kms north of Boulia is another 9 out of 10 on the Hillier camp scale. 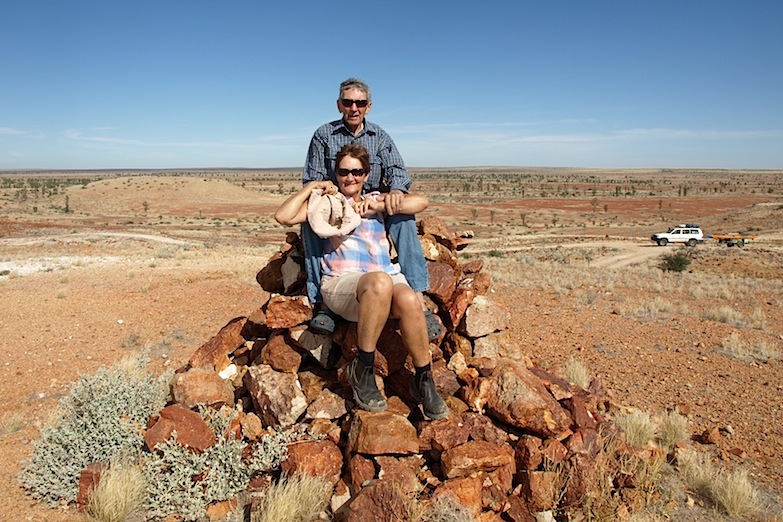 Our bivvy floor is a mixture of sandstone stained with all colours of the rainbow, our roof is made up of branches of the mulga tree and our walls are spinifex and wallaby grass, a very acceptable camp and again one that will remain in our memory. Our entertainment tonight was the antics of insects attracted to our camp light. Insects around lights, like they were tonight, can be a hazard if you want to share the same light, not only because they get into your tucker but they can get into your ears as well, which is what happened to me near Cameron’s Corner once. A small moth, attracted to the light, dropped down and found its way into my ear. It sounded like an elephant stomping around. The question was, how were we going to get it out? The nearest hospital was over a hundred kilometres away. Fortunately we had a drinking straw in the car so Bev delicately placed the straw in my ear and sucked. She ended up with the moth in her mouth! A better way to remove insects from your ear is to hold a torch to the ear and most times the offending insect will be drawn to the light. 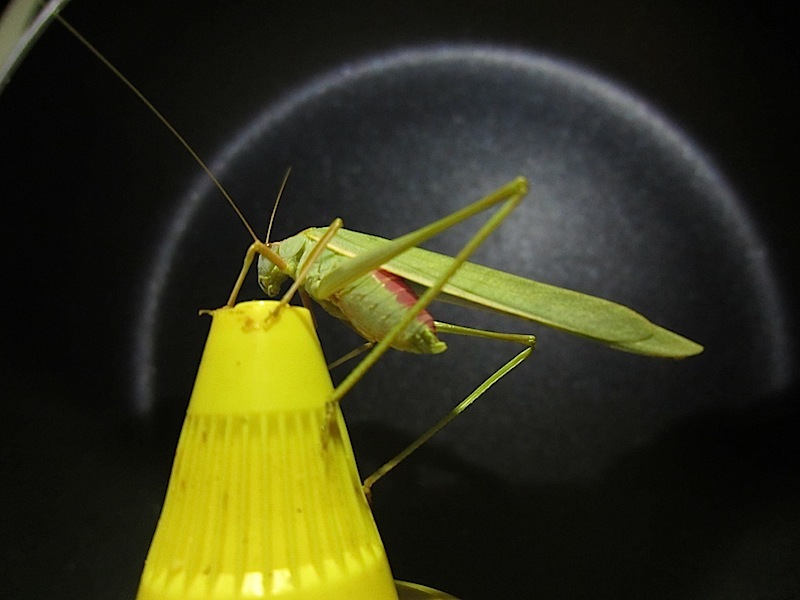 Why are insects drawn to artificial light? There are a number of theories relating to this vexing question but one indicates that nocturnal flying insects navigate using the moon. To them, an artificial light is a miniature moon but since an artificial light source emits light in all directions they get confused and so they fly around and around the light until they drop from exhaustion or are burned to death. I do wonder though when there is no moon do the insects remain inactive? One of the locals that entertained us. As best as I can determine, this is a Common Garden Katydid. Katydids are usually heard (they make a sound similar to a cricket) but not seen, they prefer to hide in foliage and are experts in camouflage. If this is the case we were lucky to see this chap. When insects invade our camp at night I wonder if there are some that have never been identified. All avid travellers have seen more than they remember and remember more than they have seen.